We have one game left, and we are beyond quick predictions, and beyond six predictions at that. So for the big game, we bring out a couple more experts, and we give everyone a couple hundred words to work with. We’ve been making these predictions ever since 1999, when our panel correctly picked what everyone in Division III thought was an upset — Pacific Lutheran over Rowan. Last year, our panel correctly picked Mount Union, in a 5-3 decision over Mary Hardin-Baylor. Nobody consulted with one another. Feel free to add your pick and reasoning in the comments section below. Sometimes the entirety of a football season, especially a 15-game one, is a battle of attrition. Last year, surely, UMHB would have liked to have had T.J. Josey healthy for more than a couple of snaps in the title game. This year, that person could be De’Nerian Thomas for UMHB or Jared Ruth or Cole Moxie for Mount Union. Or D’Angelo Fulford for the Purple Raiders, for that matter. Regardless of who is able to go, though, the keys will likely remain the same: control the running ability of whomever is taking snaps. Keep the receivers in front of you so the quarterback can’t burn you with the deep ball. That sort of thing. When I moved my No. 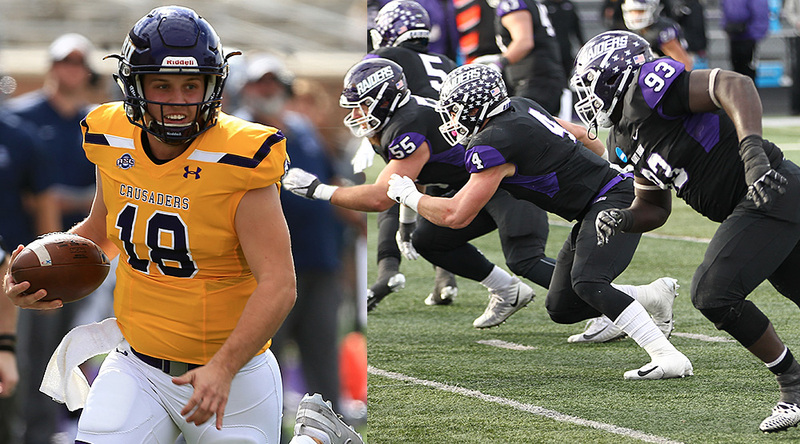 1 vote from Mount Union to UMHB earlier in the season, it was with the thought that the Cru have enough quarterback options to provide the depth needed for the long haul. Now, however, the offense has to be in doubt a bit. And perhaps that’s true for both sides. Regardless, I’m looking forward to a game that has a bit more scoring than last year, despite all the time I just spent doubting everyone’s offense. I’ve had UMHB No. 1 since midway through the season, and in beating three top-10 teams (Hardin-Simmons, St. John’s and UW-Whitewater) to get to the first Stagg Bowl held in their home state, the Crusaders earn the right to go in favored, even against the defending champions. Mount Union’s best trait this year seems to be something that’s hard to quantify — the ability to win a game however it needs to be won, with opportunistic defense, high-powered offense, grit — so by no means is this a “it’s definitely going to happen this way” pick. Both UMHB and UMU are in the Stagg Bowl because they’re adaptable, and because they mirror each other — the direct-snap run package, the turnover-causing defenses, the swarming tacklers. So this game might not be much prettier than last year’s, unless one side figures out how to turn turnovers or special teams plays into points. If it boils down to a conservative defensive slugfest where both teams need to play mistake-free, UMHB has the edge. Both teams enter Friday’s rematch with questions behind center. Is Jase Hammack healthy enough to start and finish the game? Is DeNerian Thomas healthy enough to provide a run/pass threat and change of pace? Will former quarterback turned wide receiver T.J. Josey be pressed into quarterback duties, a la Cecil Shorts in 2010? On the other side, is D’Angelo Fulford physically and mentally recovered from his rough outing in the semifinals? Or will the Purple Raiders be forced to rely on running back Josh Petruccelli taking direct snaps to grind out a win? I don’t think Mount Union repeats its performance from last week. Instead, I think the Purple Raiders repeat as champions for the first time since 2005-2006. Like they did in Stagg Bowl XLV, the Cru will struggle on offense due to inexperience at the quarterback position. The Purple Raiders will load up to stop Markeith Miller and will come up with enough big plays, either turnovers or on special teams, to squeeze out some points against the nation’s top scoring defense. This could be a heartwarming story for the local program, but the Purple Raiders will refuse to cooperate. Mount Union has the rare chance to do something the program has never done before, winning a Stagg Bowl outside of Salem. Mount Union’s playmakers on defense get the job done, leaving the home crowd in Shenandoah disappointed. Despite the fact that this Stagg Bowl features the teams with the first- and second-best scoring offenses in the nation, I don’t forsee this as being an obscenely high-scoring game. The fact of the matter is that these defenses are among the elite, too. UMHB’s journey (involving the dismantling of two Top 5 teams) has prepared them better for the destination than did Mount’s. The past two weeks have proven UMHB’s ability to expertly defend against both the pass and the run, and the team can move the ball to get the points it needs. Mount, on the other hand, has a lot of great aspects but has shown vulnerability at times, and I think they haven’t really faced anyone yet to take advantage of those soft spots the way UMHB can (and will). It’ll be a good game, but the home-state squad gets the W.
I see this game as a huge first-half chess match, with two teams that will resume a tight, conservative battle from last year’s game and two defenses that will thrive in that. However, the changes that UMHB made between last year and this year focused on their offense and the issues they experienced in the pocket. That meant finding a pocket passer and also a quarterback with pure speed that could ensure the ball moved out of the pocket quickly. Eventually, that will pay off for UMHB. They’ll take a lead in the second half, and that will inspire D’Angelo Fulford to fight back — an offensive showdown will finally develop between the teams. On paper, the teams line up very evenly. That means the home-state advantage matters here — with the crowd likely being 6-to-1 in favor of the CRU. That’s why I give them the edge in a higher-scoring game than many people expect. Here we are again. Despite usual and expected grumblings about bracket balance, the best two teams in the division have reached the final. Once again both teams have suffocating defenses. While I don’t expect the same absence of offense that we saw last year, points will still come at a premium. Both teams also enter with some questions at quarterback. UMHB has been nursing Jase Hammack’s shoulder through these playoffs and his primary backup — DeNerian Thomas — is questionable for Friday. On the other side D’Angelo Fulford has battled an ankle issue and inconsistency through these playoffs; enough so that the Purple Raiders turned almost exclusively to a running back direct snap package in the fourth quarter of their semifinal. The run defenses being deployed in this game will demand that these quarterbacks conjure a moment of two of brilliance, without backbreaking turnovers, for their teams to be successful. I expect this game to tilt on a big special teams play or a a turnover. Through these playoffs, the Crusaders have taken better care of the ball and, if there is one area of clear separation between these teams, it is the Cru’s kick return units. I’m going with the Crusaders to win their second title in a tight, thrilling ballgame. Mary Hardin-Baylor 20, Mount Union 16. Arguably the top two defenses in the division, each facing an offense that put up video game numbers in their respective league. Throw that out: Both leagues were down this year. This game will be another defensive battle, like last year in Salem. We have seen both teams prepare their version of the Wildcat for this game, with both having won titles by running some variation of it in past years. I like Mount Union in this game, even though it’s a road game. They are disciplined enough to keep UMHB WR’s AND kick returners out of the end zone. We have all seen the highlights, Simms runs 90 yards faster than most humans run the 40. I like that Mount Union has a QB in Fulford who has been in an intense spotlight for the past 56 weeks. He can erase a lot of the questioning on Friday night, and I guarantee he knows that. I just feel like he makes one more play – and that’s all it will take to separate these two teams. One caveat: Mount Union must play clean: No personal fouls and no procedure penalties. If I’m Vince Kehres I’m confident in my players to play fast, make physical mistakes not mental ones. Mount Union 13, Mary Hardin-Baylor 10. Both teams have high-scoring offenses, stingy defenses and quality coaching staffs, so this game is a toss-up that could be decided in three areas. First: If Mount Union can shut down UMHB’s rushing attack like it did last year and free up a Purple Raiders defense with 67 sacks to pin its ears back and go after the passer, then I like Mount Union’s chances. If the Crusaders can have some balance on offense, they might have the upper hand because of their playmakers on the outside. Second: If Mount Union quarterback D’Angelo Fulford is able to consistently make plays with his legs when UMHB drops into pass coverage, the Purple Raiders have the edge. The Crusaders have to keep Fulford in the pocket. A QB who is dangerous on the run will give any defense fits. Mount Union has one. UMHB doesn’t. Third: I think UMHB has the advantage when it comes to special teams, specifically the return game. Aaron Sims and K.J. Miller can turn a game around because they’re threats to score anytime they get the ball in space. All of that being said, of course I’m picking UMHB. The people in this football-crazy state would find a tall tree and a short rope if I didn’t. I’ll say UMHB 24, Mount Union 21 in what will seem like an absolute scorefest after the last two Stagg Bowls. This entry was posted in General, Quick Hits and tagged Mary Hardin-Baylor, Mount Union. Bookmark the permalink.